DiskUsage is really quite a simple application: upon being opened, you are prompted to select a storage location to view (internal storage or SD card). DiskUsage then scans the location (this can take up to a couple minutes for an SD card that has lots of files and directories) and displays a visual representation of your (wait for it) disk usage. The beauty, however, is not what this app does alone - it's how it does it. The fluidity and usability of the UI are ingenious - without them, this app wouldn't be holding the spot of the App Of The Week. You can either use the 2-finger pinch and zoom or a simple click on any interesting location to delve deeper into your phone's directories to root out space-hogs, which, by the way, float to the top. 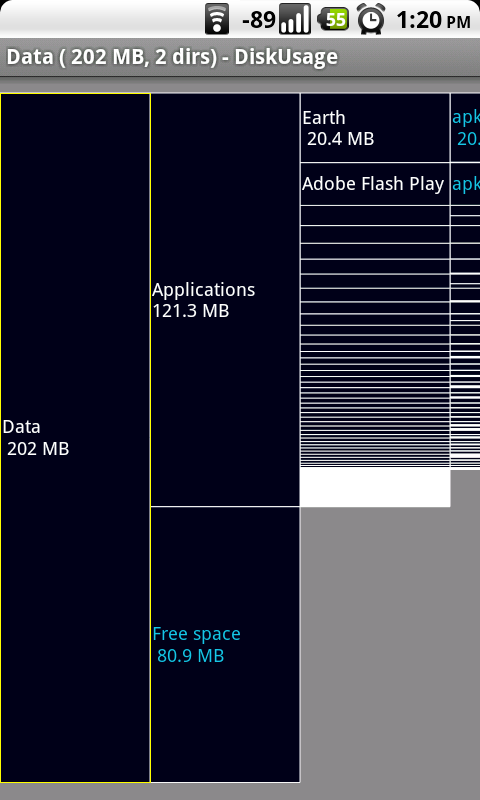 While we here at Android Police love Adobe Flash 10.1 for Android, it is certainly a bit greedy with my Nexus One's internal storage (note from Artem: wait till you see NFS Shift at 40MB). If you select (tap) an "apk", then hit the Menu button and select "Show," you'll be transported to the selected app's page in Manage Applications, where you can easily uninstall it from your device. Handy, no? DiskUsage also helped me realize that I had over 3GB of Nandroid phone backups quietly eating up space on the precious SD card. Note from Artem: Did you guys know ASTRO already includes a similar tool, built right in (though limited to SD card only)? ASTRO users can hit up the Tools menu and click SD Card Usage. 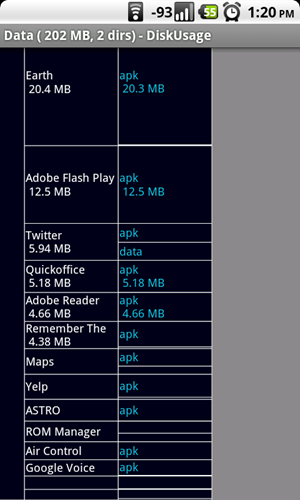 DiskUsage is available on the Android Market for FREE, and is an app everyone should have regardless of how often it ends up getting used.